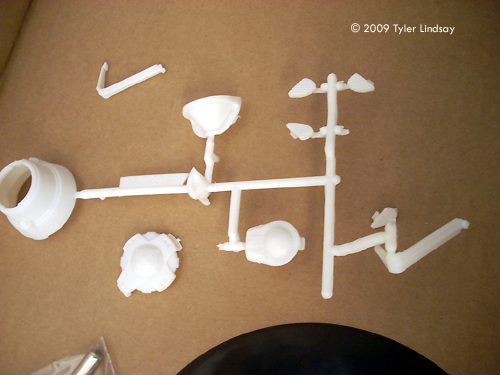 Parts: 43 pieces (white and clear injection molded styrene, plus metal rod). 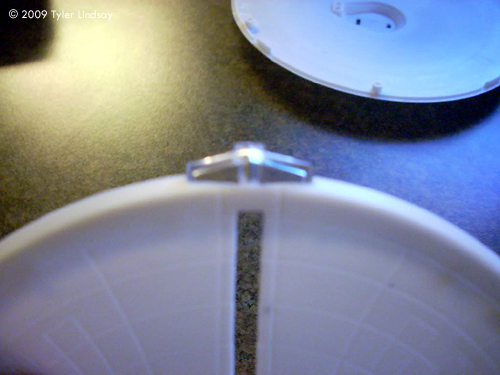 Image: Upper saucer. Gridlines are a bit ... pronounced. I used to watch the original series of Star Trek when I was younger, and always thought the Enterprise was a great looking ship. 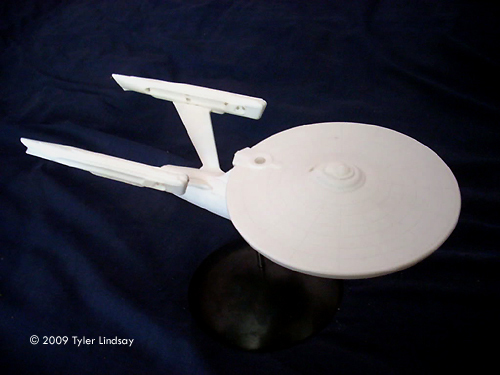 Then I watched The Motion Picture, and saw the Refit Enterprise when Kirk and Scotty did their external inspection of the ship while is spacedock. I was in awe. 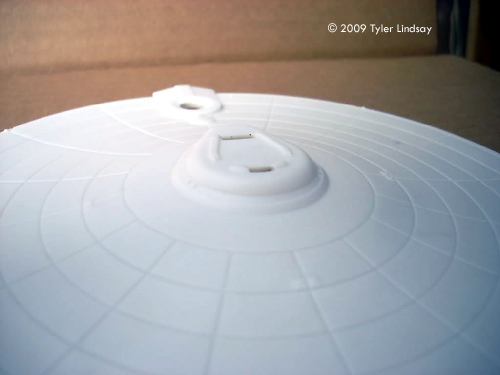 Over the years, I built the AMT kit several times, but was never really satisfied due to lack of accuracy and the problem of the drooping saucer and nacelles. 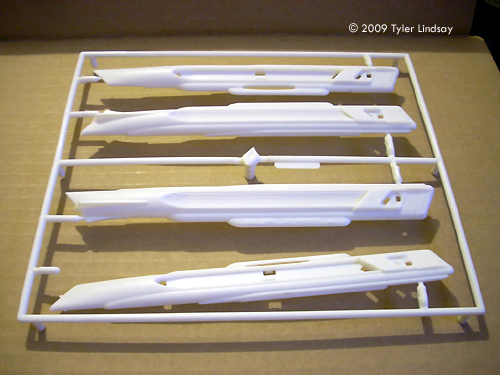 But Polar Lights took our favorite ship and not only did they address the droop problem, but put the ship into a manageable scale for us modelers who are limited on space. 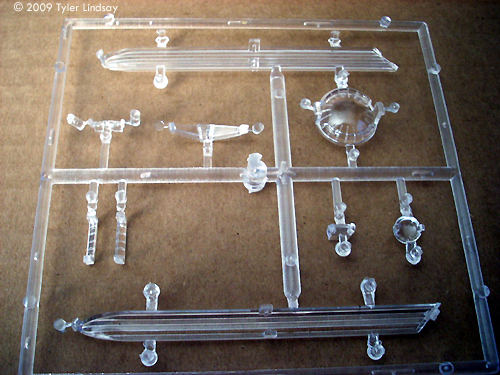 The kit is a Level 1 Snap-Kit, with very easy to follow instructions. The level of detail, which noted by some had unusually deep panel lines, was very crisp and well done. 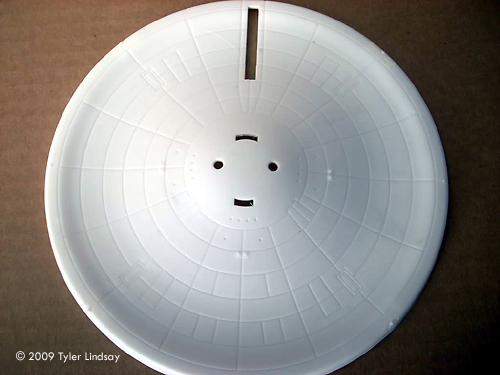 There is no flash or other flaws on the kit. 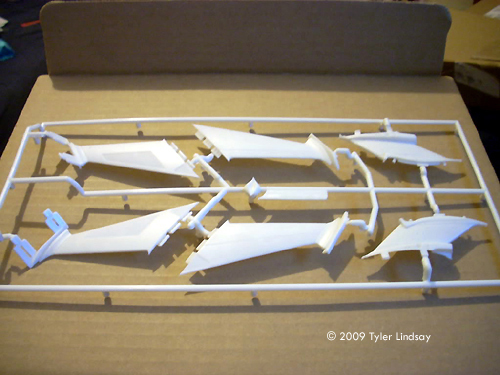 There are a total of about 43 pieces, mostly white styrene, with one sprue of clear parts which include the inner warp grilles, deflector dish, torpedo launcher, impulse engines, impulse crystal and officers lounge. 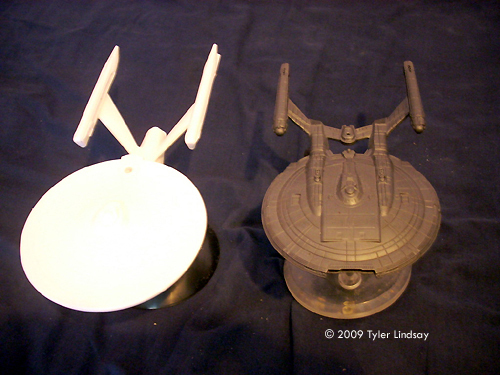 The base is a simple rounded deal with a metal rod and optional ball joint so you can display your ship in a variety of angles. 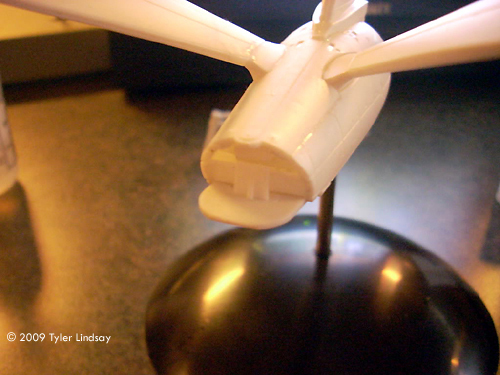 The ship is lightable, with enough room in the nacelles to put a small ccfl tube with some modification (you'll need to be careful about cutting behind the nacelle grills because they're supposed to snap in, so that doesn't leave you too much to cut out), a small cavity behind the deflector dish for an led or two, and plenty of room in the saucer for lights. 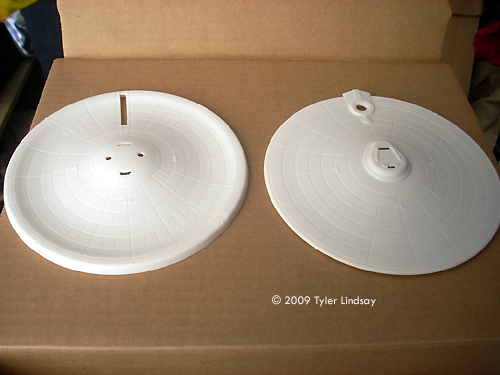 I had the opportunity to build a pre-production test shot, so some details may change when the kit is finally released in late 2009 or early 2010. 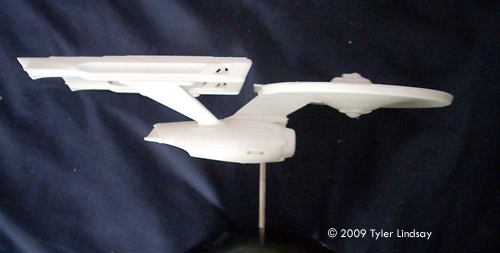 Polar Lights did a good job especially on the secondary hull where the warp pylons go into the hull. 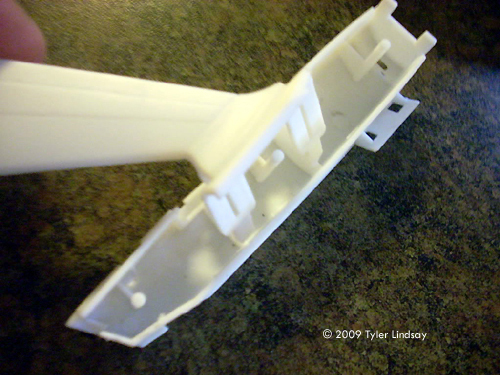 An inch long tab extends into the hull and snaps into place to prevent the dreaded nacelle droop that has plagued earlier versions of the kit. 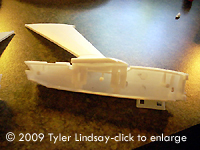 The assembly seams on the secondary hull are also not noticeable, due to the fact that once you have the engineering hull assembled, they are placed where the panel lines are. 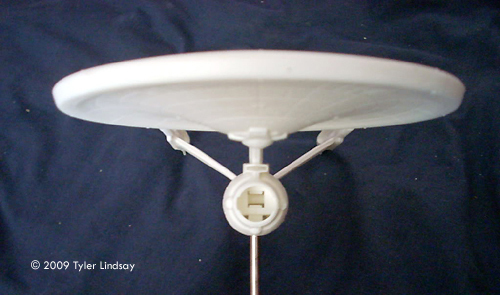 The saucer section was straightforward on assembly. 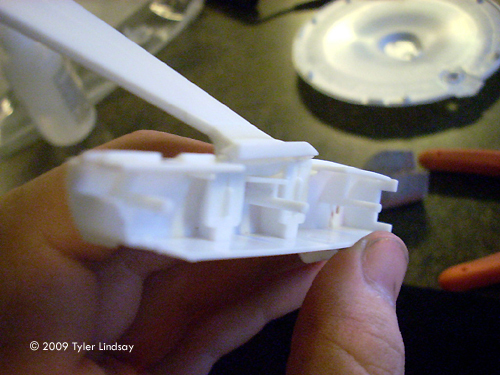 Simply glue the impulse crystal and impulse engines into place from the inside, glue the saucer halves together and snap the bridge and lower sensor array into place. 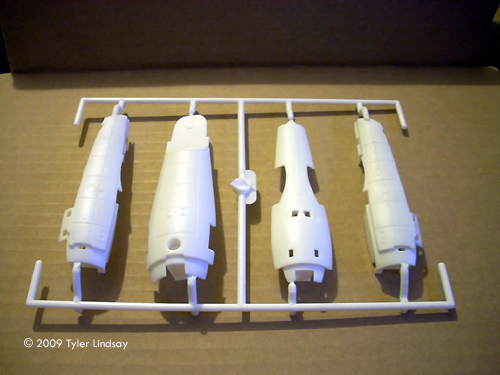 The only places that needed some TLC was installing the torpedo launcher into the neck, which I reccomend gluing into one half of the neck, then gluing the other half of the neck together, and snapping the saucer onto the neck. 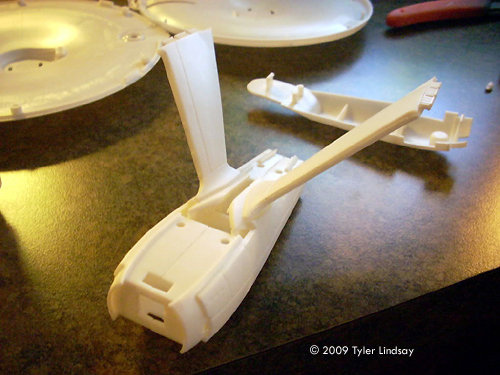 Also, there is a gap between the end of the secondary hull and the shuttlebay piece, but that is also going to be fixed for the production run. But other than that, I like how it went together, everything was straightforward with consideration given to the strengthening of the warp pylons. This is a very well designed kit. I'm no expert on the ship, but the detail is pretty good, and at 1/1000 scale, easy to work with and small enough to build and display several. 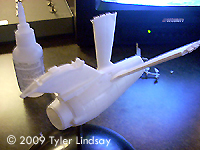 This page copyright © 2009 Starship Modeler. 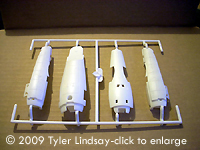 First posted on 30 November 2009.